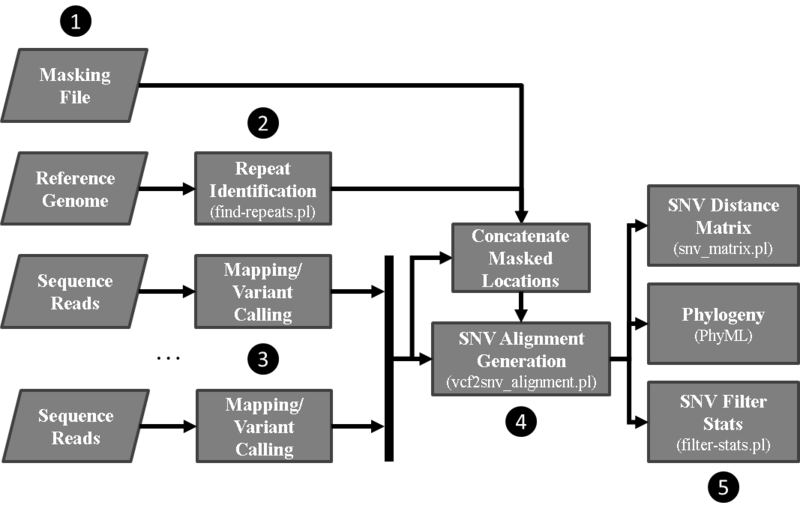 The SNVPhyl (Single Nucleotide Variant PHYLogenomics) pipeline is a pipeline for identifying Single Nucleotide Variants (SNV) within a collection of microbial genomes and constructing a phylogenetic tree. Input is provided in the form of a collection of whole genome sequence reads as well as an assembled reference genome. The output for the pipeline consists of a whole genome phylogenetic tree constructed from the detected SNVs, as well as a list of all detected SNVs and other information. The pipeline is implemented using the Galaxy bioinformatics analysis platform. To quickly get started with SNVPhyl, a command-line interface is provided to interact with Galaxy. This can be configured to deploy a Docker image which includes all the SNVPhyl tools and an instance of Galaxy. This assumes that both Python and Docker are installed. If Docker requires sudo to run, please append --with-docker-sudo to the above command. Once running, SNVPhyl/Galaxy can be accessed from http://localhost:48888 with username admin@galaxy.org and password admin. Please see Usage and Installation for more details. A set of sequence reads (fastq format). A reference genome (fasta format). An optional file of regions to mask on the reference genome (a special tsv formatted file). Identification of repeat regions on the reference genome using MUMMer. Reference mapping and variant calling to identify high-quality SNVs (hqSNVs) using SMALT, FreeBayes and SAMtools/BCFtools. Merging the identified hqSNVs to construct a multiple sequence alignment. Building a maximum likelihood tree with PhyML and generating other output files. SNVPhyl is implemented as a Galaxy workflow, with each of these stages implemented using a specific Galaxy tool. More information on the operation and installation of the pipeline can be found in the Usage and Installation sections. Code is available on GitHub under the https://github.com/phac-nml/snvphyl-galaxy, https://github.com/phac-nml/snvphyl-tools, and https://github.com/phac-nml/snvphyl-galaxy-cli projects.